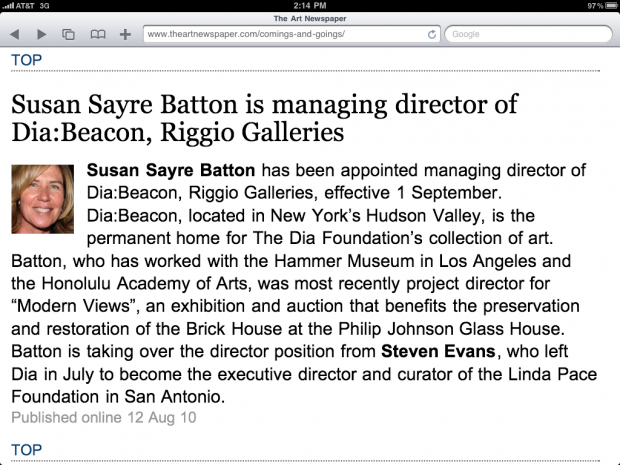 Susan Sayre Batton, who was deputy director of the Honolulu Academy of Arts from 2005 to 2008, is now the managing director of Dia:Beacon. While here, she focused on strategic planning and development of the facility, staff and collections management. She worked tirelessly to produce the 2007-2009 Academy Strategic Plan, with the support of key staff members. The plan dovetailed with the requirements of the American Association of Musuems toward professional compliance in ethical policy, disaster preparedness and collections management. Batton and a team of senior staff authored the AAM Re-Accreditation Self-Study, and directed the Site Visit—efforts that led to the Academy’s successful re-accreditation in December 2007. Before joining Dia, Batton was an interim deputy director at the Hammer Museum in Los Angeles, and she just completed her post as project manager for Modern Views: A Project to Benefit Farnsworth House and the Glass House. The Academy congratulates Susan on her new position!